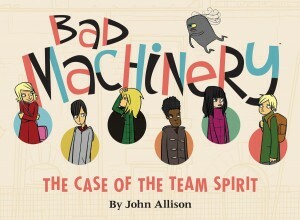 Bad Machinery Volume 1: The Case of The Team Spirit collects the first major story arc of John Allison’s webcomic Bad Machinery, which is actually his third webcomic set in the same universe. Allison is most well-known for its predecessor, Scary Go Round, which ended in 2009. However, despite the fact that Allison has worked in the same overall setting for years, knowledge of his earlier work isn’t necessary to enjoy Bad Machinery, which is both a new series and a bit of a reboot. Characters familiar to long-time readers do appear in Bad Machinery, but only in supporting roles. Although I’d read the occasional Scary Go Round strip, I wasn’t particularly familiar with the world of Tackleford, so I approached Bad Machinery with fresh eyes. Bad Machinery tells the interlocking stories of a half-dozen or so students at Griswalds Grammar School in Keane End, Tackleford. To a certain degree it’s about the kids solving mysteries, with the girls and boys keeping tally of each team’s “victories”, but in this first volume, the mystery didn’t necessarily feel like the driving force of the story. Instead, Allison is content to spend time with the kids in their daily lives – going to school, doing projects, fighting bullies and nursing crushes. The boys are more determined to solve the mystery of their favorite football club’s bad luck, but that doesn’t stop the girls from uncovering important clues that come to play in the book’s resolution. I definitely enjoyed reading Bad Machinery, and to a certain degree it reminded me of another book I’ve been reading, Skippy Dies, which also focuses on the lives of kids and teachers at a British school. Bad Machinery is a much more all-ages book, however, and has none of the vulgarity or adult themes found in Skippy Dies. Although this volume of the strip does build to a resolution and reveal of the central mystery, I felt like it definitely showed its origins as a webcomic. Most of the book’s pages ended with a gag in the sixth panel, and the pacing was loose and a bit rambling. Although Allison always meant to collect the strip in story arcs, I think it is best enjoyed if you keep its webcomic origins in mind when reading.